1 x 240g Organic Orange & Honey: Each jar of Organic Orange & Honey has been carefully collected, infused and sealed by hand, retaining a luscious citrus flavour. 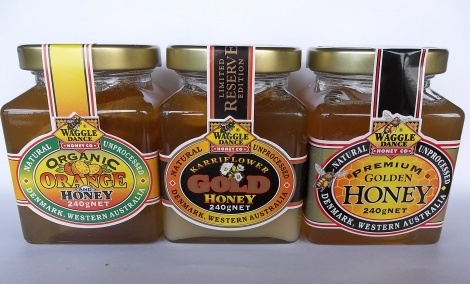 This elegant honey is truly a gourmet's delight. 1 x 240g Karri Flower Gold: A delightful medley of pure fresh creamed honey, topped with liquid honey, with a luscious slice of orange. Ingredients: Western Australian Honey, Organic Oranges, naturally dried, organic certification NASSA No5086(no additives).